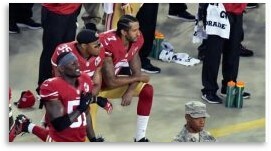 Is Colin Kaepernick Getting it Wrong? Here in America, we have the right to freely express ourselves and I would remind all of my Conservative friends that Mr. Kaepernick is exercising his right to do so in kneeling while the national anthem is played to start football games in which he is participating. I would remind all of my Liberal friends that those on the right that are voicing their disapproval are exercising their right to expression as well. We cannot extol or decry an expression of opinion based on how we feel about that opinion. It doesn’t work that way. That being said, I think Mr. Kaepernick is missing something that is crucial to the argument. He said that he could not stand up to show pride in a flag for a country that oppresses black people. The flag represents the United States of America – it’s people, it’s government and it’s institutions. To say that our country oppresses black people would indicate that racism in America today is institutional. Institutionalized discrimination refers to the unjust and discriminatory mistreatment of an individual or group of individuals by society and its institutions as a whole, through unequal selection or bias, as opposed to individuals making a conscious choice to discriminate. What we are experiencing today is not the former, but the latter. If our country was systematic in the “oppression of black people”, as Mr. Kaepernick is saying it is, then how is it that a black man occupies the highest office in the land? How is it that Admiral Cecil Haney rose through the ranks to become Commander, U.S. Strategic Command? The entire US fleet of nuclear missile submarines, along with intercontinental ballistic missiles and nuclear bombers are under the command of Admiral Haney. He is one of the most powerful military officers in the entire world – in command not just of the nation’s nuclear forces but its space satellites and cyber weapons as well. How is it that Kenneth Chenault became CEO and Chairman of American Express? A Fortune 500 company, American Express is the 22nd most valuable brand in the world with nearly $160 billion in assets. It is one of the most influential financial services companies in the world and Mr. Chenault has been at the helm since 2001. How is it that Franklin Raines became CEO of the Federal National Mortgage Association? At $131.9 billion, the company commonly known as Fannie Mae, is the 5th largest financial services company in America. Headed up by Mr. Raines, it is a unique enterprise in that it has been government-sponsored since 1968 and is publicly traded. As a matter of fact, if racism is institutional, how could it be that the following list of African-Americans currently hold or have recently held positons of power in the United States? It seems to me that this abbreviated list of examples would indicate that our problem is not institutional. It also seems to me that approaching the problem as though it were, could keep us from answers and solutions that would rid our land of racism in all of its forms. Next Next post: Do We Have it Wrong?